Thank you for visiting the Crawford County Attorney's website. I have created this website to provide information regarding the system and courts in this jurisdiction as well as general information to the viewing public. 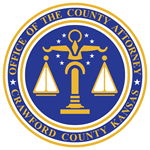 The Crawford County Attorney prosecutes violations of the criminal laws of Kansas; institutes proceedings to protect abused and neglected children; prosecutes juvenile offenders; secures care and treatment in alcohol, drug and mental commitment cases; appears before the appellate courts of Kansas; and provides services to victims and witnesses to ensure their fair treatment in the criminal justice system. I'm honored and privileged to serve the citizens of Crawford County as your County Attorney. Information regarding the availability of criminal restitution, recovery of damages in a civil cause of action, the crime victims' compensation fund and other remedies, and the mechanisms to obtain such remedies should be made available to victims. Information should be made available to victims about their participation in criminal proceedings and the scheduling, progress, and ultimate disposition of the proceedings. Enhanced training should be made available to sensitize criminal justice personnel to the needs and concerns of victims, and guidelines should be developed for this purpose.